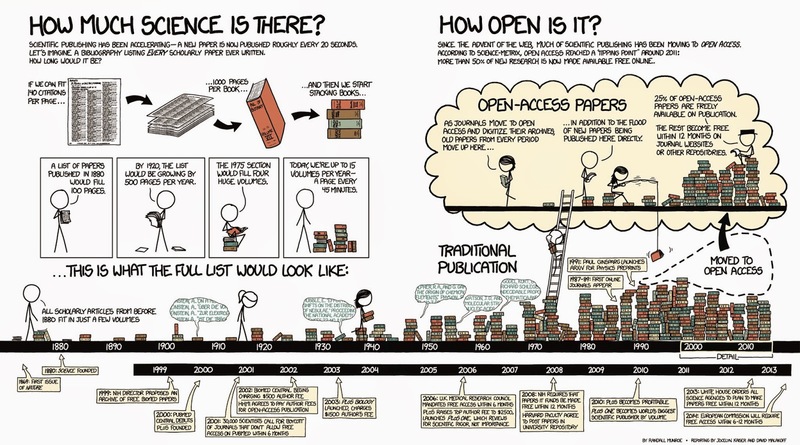 The number of scientific journals and the papers they publish keeps growing. Because a lot of this publishing only happens online, the limits to article lengths are also being adhered to less strictly. This has led to a situation where any normal human being can no longer keep abreast of the developments in their field simply by scanning "all" the relevant journals. Which ones are relevant? Which ones are nonsensical, or predatory? How do you find what you need? How do you get access to what you need? How do you organise your own knowledge base? And how so you do this collaboratively? Here we will address these questions and the principles behind them, illustrated by some current examples. When you are just getting into a new research topic, you will want to develop an overview of the different publications that speak to this topic and discover which of these are open access. 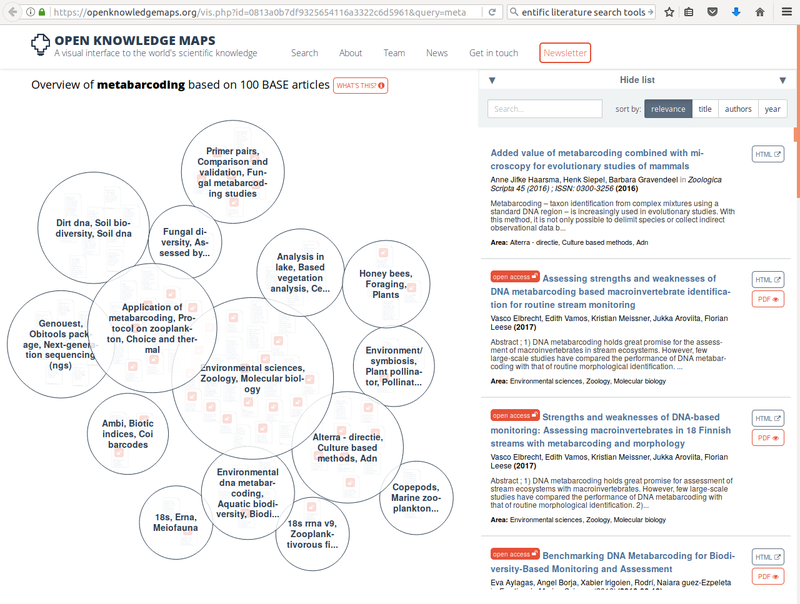 One tool that you might like to know about, the open knowledge maps tool, shown in example 1 here gives an overview of the concepts related to the keyword "metabarcoding" and the 100 most relevant articles related to it, grouped by text similarity. The bubbles show the results of this clustering-by-similarity, and in each of these bubbles, the articles are shown (red icons are open access publications). As an exercise, now go to google and search with the same keyword. Notice how most of the results are not relevant papers, but any website that qualifies by google&apos;s proprietary algorithms, and no indication is given about openness. The example of the Open Knowledge Maps tool showed a very powerful technique that did not require you to have a great deal of rigour in composing your search terms: the tool did it for you. Under some circumstances, for example once you have learned more about the terminology used in a particular field, you may instead want to be more precise and specific and use commonly agreed-upon terms with an accepted meaning. One example of this is in the medical field, where so-called MeSH (Medical Subject Headings) terms are commonly used in composing search queries in the medical literature. This query gives, at time of writing, only 537 high-relevance results, whereas searching for dna barcoding yields 3278. Among these results is, for example, a paper about the application of DNA barcoding to faecal samples of birds. If we click on that hit we are taken to a page that displays the abstract. Assuming that we are interested in the aforementioned paper, we might want to follow up and go to the publisher website, whose link is displayed in the top right of the page. However, depending on where you currently are (e.g. you might be at home, where you don&apos;t have institutional access) you might not be able to retrieve the PDF, which is reserved to subscribers, institutional or otherwise. To circumvent this issue, as of time of writing, a perfectly legal browser plugin has become very popular: unpaywall. This plugin exploits the fact that certain people (such as the authors of a publication) are generally acting within their rights if they make a PDF of their paper available elsewhere. The plugin discovers these alternative locations and re-directs you to it. If you haven&apos;t already, please install the unpaywall plugin that matches your browser, and then click on the publishers link on the top right of the pubmed entry. You should now see a green, open padlock icon somewhere on the screen (precisely where differs a little between browsers). If you click on it, the PDF file will be downloaded. Magic! Another browser add-on that may help you locate a PDF version of an article is the google scholar button, which lets you use a highlight phrase as a search term and then locate all the versions of a matching publication that are on the web. This often helps to find PDF versions that authors have posted, for example, on ResearchGate. At present, the most popular of these is probably Mendeley. It has several virtues: similar to the unpaywall bookmarklet, there is also a mendeley bookmarklet that allows you to import a citation entry from a variety of search engines (such as pubmed) as well as publisher webpages with a single button press; it allows you to make shared bibliographies that you can organise collaboratively; it has a plug-in for Microsoft Word that allows you to insert literature citations directly into the manuscript that you are working on, which then will be formatted according to the selected citation style. To make this work across computers and within research collaborations, you will need to install the Mendeley desktop application on each of the participating computers (whether your own or of a collaborator). The application will then synchronise bibliographies and PDFs across these installations on request. This way, you and your collaborators all around the world can assemble a shared collection of relevant literature. We collected our references using the Mendeley browser bookmarklet, which resulted in a public library. We then made sure in Mendeley Desktop that every reference has at least an author, year, title, journal, and doi. We also made sure that all authors only had initials in their first names. We wrote a script that converts the bibtex file to a list of references in Markdown. While writing the various pages, we cited the references by their bibtex key (a unique identifier that you can make up yourself, for which we used AuthorYear), creating a clickable link to the list of references, using syntax such as: [Zhang2014](../REFERENCES/README.md#Zhang2014) This might seem complicated at first, but it ensured consistent formatting and linking and once we had this workflow in place it was easy to add more references and cite them.